Welcome to the podcast. It’s a new year and a new day. I’ve decided to focus on 90-day goals this year instead of yearly goals. It’s one of the steps I’m taking to reduce overwhelm. Reducing overwhelm means that you recognize it and stop doing the things that cause it. Stop and decide what one thing you need to focus on. Don’t take on anything else until the one thing is done. Be sure that one thing is a path to cash. If you have a to-do list, put 3 things on it that can be accomplished in one day. Hey, what’s upeverybody, Joe McCall, Rei In Your Car. Hope you’re doing well. Today I’m going to be talking about How to Reduce the Overwhelm. So it’s a beautiful day right now, actually it’s overcast and low thirties, but it’s still a beautiful day. Everyday is a beautiful day. It’s the start of the brand new year as I’m recording this and I’m excited because we’ve got a whole year ahead of us and one of the things I’m excited about is I am breaking down my goals into 90 day chunks, so I’m not even looking at my annual goals right now. I am just looking at my 90-day goals so it’s a little less overwhelming. My intent of this podcast is really kind of talk about like How to Reduce the Overwhelm and it becomes really simple when you just have one thing that you’re focusing on. If you’re overwhelmed, you’re focusing on too many things, alright? You need to have just one thing. What is the one thing in your business? You’ve heard of that book, The One Thing… I’ve only read half of it, I don’t know. I need to finish it. Nothing was wrong with it. It’s just like, oh, this is so cool. I’m going to go do it and never got back to finish reading the book. But the, there is another really good book I read called the Pumpkin Plan. If you guys haven’t read that, I would really strongly suggest that you go check it out. It’s the Pumpkin Plan and it’s all about to growing giant pumpkins. And the guy tells the story, Mike Michalowicz, of how these farmers mostly in New England maybe, I don’t know. No, no, they’re all over. But there’s a guy in New England somewhere up there who sells these pumpkin seeds for like a thousand $2,000 for each seed, okay. And what these people do is they grow, they buy a seed and they grow this pumpkin. And if you know a pumpkin plant, you know, it has several different branches and there’s different pumpkin’s on each pumpkin plant. What these guys do is they look for the most promising little baby pumpkin and then cut off the branches on all of the other pumpkin. So all of the nutrients that come from the roots are all fed into that one pumpkin. I don’t know if they do fertilizer and all that, but the point is that they focus all of their time and energy then on that one pumpkin and that’s how you grow giant pumpkins. That’s how you grow giant businesses. It’s all about focus. It’s finding your sweet spot and focusing in on that. And it’s a little scary. I know it is, scary for me sometimes, but I know every time I’ve done that in the past and as I do it in the future, that’s going to be my most profitable avenues, okay. 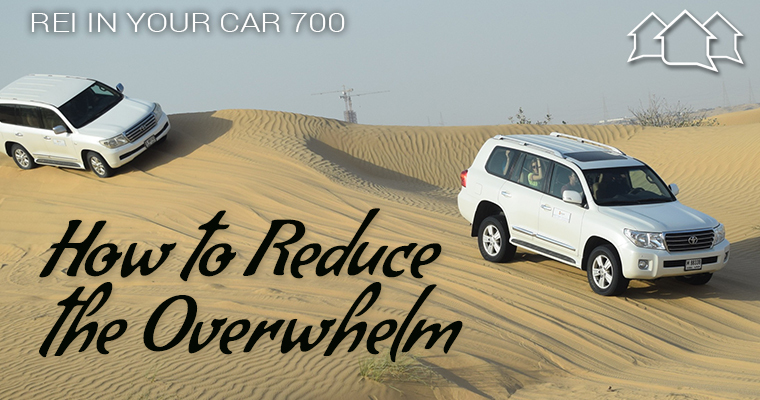 So how do you reduce the overwhelm? You know, if you’re like me, you like to have these huge to do list because I use kind of like I kindof used to do list as my brain dumps as I’m reading or thinking or even reading the Bible in the morning or whatever. And I think of something I got to do, I add it to my to do list, well what happens? Well, my to do list gets huge and it gets overwhelming and I’m like, ah. And then I never look at it and it’s like maybe a month later I’m looking at my to do list, like, oh, I forgot to do that thing dog+gone it. Well, okay, that’s my story. But what I have been doing lately, which is helpful, extremely helpful for me because I’ll just write down like three things that I got to do that day. And I like to write them down the night before. So if I write it down the night before, I don’t wake up in the morning stressed like, Oh man, what am I going to do today? And I could just look at that list and I see these three simple things that I got to do and these things that I got to do that I’m putting on there. It’s not like lose five pounds, okay. You can’t do that in one day for one thing. But it’s not these big monstrous tasks. It’s just like the next step of whatever I want to do. So, I’m thinking in my mind, alright, what’s most important for me right now in my business? And I’m talking specifically about business, not personal stuff, right. But like, what’s my fastest path to cash right now? And I think about that, okay, well its marketing making offers or it’s doing a podcast or whatever it is, right? So what’s my, what’s my most important thing I could be doing? What’s going to give me the highest return on my time? And then I think about that, okay, now what’s the next thing I got to do to accomplish that? Not the 20 things I got to do to accomplish that, but just what’s the next thing? Here’s the power of focusing on just the next thing. The next thing after that will just magically appear. So it’s okay when you’re looking at your stuff to do, if you just put a small little task on there because when you get that small little task done, it gives you like this endorphin rush where your like, yes, okay, I got it done now. Then all of a sudden you become this productive beast and you start doing a bunch of stuff and you start getting a lot done because you’re just focusing on that little next baby step. It may feel overwhelming to you, but as you just get those little baby steps done, the momentum starts to build and you start getting excited and you start getting. It just becomes easier. Does that make sense? Becomes easier to get the next stuff done. So if you’re feeling overwhelmed, it’s because you have too many things on your to do list. It’s because you are focusing on too many things. Take a step back, take a deep breath, relax a little bit, it’s alright and what I want to do a deal in the next four weeks and that’s your one thing. Well, is it really like what, what does that mean? Like how do, how do you do a deal? Well you got to make offers? Alright how do you make offers? Well, you got to talk to sellers. So how you talk to sellers? Well you got to do marketing to get leads. Alright, so how do you do marketing to get leads? Maybe marketing is your one thing, right? So now you have a marketing plan. Every day I’m going to call five old leads. That’s the one thing for today. Or I’m going to make five offers on the MLS, going to send 500 postcards this week. So just be focused on that one thing. If it’s deals, break that down into something you can control. And then it’s now marketing. Okay? What kind of marketing letters? Okay, what kind of letters? Yellow letters. What kind, to who? Yellow letters to expired listings. Boom, there you go. To where, what kind of houses, what city, what zip codes? Break those down and then it’s so much easier and it’s less overwhelming when you’re looking at your to do list and it’s not 20 things long, it’s just send 20 yellow letters to expired listings, and that’s it. I remember a podcast one time this guy was talking, and this was four years ago, I mean he was talking about how competitive and difficult it was to do deals in southern California. And what he decided to do was instead of going after five different markets in Southern California with three or four different marketing channels, he just, and then he had a huge staff, he laid everybody off. It was just him and his wife. He got rid of his office and just said, I’m going to send 100 letters a day and that’s it, and he’s going to focus on just, I think it was two zip codes or something like that. One small little farm area, is what it was. And that’s what he did everyday. First thing in the morning, him and his wife would print out 100 letters and would actually mail them themselves. They would mail the letters themselves. I don’t know if they use labels or stamps. It doesn’t matter, but everyday he would send 100 letters and just focus on that one marketing channel in that one little farm area. And what happened, he started doing more deals, bigger deals. He became known as the expert in that market. Other realtors started bringing him deals. Other investors started bringing him deals. He started following up with more leads because he just simplified everything and was talking about on this podcast, just how much more simpler his life had become and how much easier it was just accomplish more things because the power of focus. Okay, so hope that makes sense. I’m trying to think of more illustrations, but this isn’t that complicated, guys, just look at your to do list. Don’t have more than three things on there and make sure those three things are aligned with your one thing. Make sense? Get out there and make it happen. All right. Oh, let me say one more thing too because it’s okay. I’m talking to myself. Give yourself permission to not have every little thing you got to do on your to do list. Give yourself permission, that’s okay. Like I have to make a couple phone calls today okay? I did not put those on my to do list because if I let myself do that, all of a sudden I’m going to have this 20 tasks to do list today and it’s going to be overwhelming. I’m not going to get it all done and then I’m at the end of the day, I’m going to look back at it, maybe only got one or two things done and I’m going to get depressed and discouraged and bummed out and it’s going to ruin. And like here we are at the first of the year, I’m going to be like, Oh, this is how the year’s going to go off to a bad start already. Talking to myself, I’m sure none of you can relate, but it’s okay to not have those little things on your to do list. It’s not the end of the world. If you don’t make that phone call, it’s okay. You can make it tomorrow. And I remember when I was working at my job in my cubic hell, I had this philosophy and this is one of the reasons why I might’ve gotten fired, but if you don’t know what I’m talking about, I talked about that in that episode a few episodes ago. I’ve never really talked about it before, but I got fired in like 2004 and it’s embarrassing. I still don’t like talking about it, but I had these emails and every email that came in, it really annoyed me because it was like other people were just making their problems mine. It’s like email is a wonderful way to pass on the responsibility to somebody else. It’s like this huge junk pile that other people can just add to your to do list on this giant junk drawer. Does that make sense, what I’m saying? And that’s a huge problem with emails, especially in a work corporate environment. If somebody wants something done and they want to just get it out of their head, they send an email to somebody else and like, okay, now it’s yours, you take care of it like you understand. So what I would do is I would get just bombarded with emails, important work related emails and I would look briefly at them, but many times I wouldn’t respond for a couple of days and I did that intentionally because guess what? Almost every single time, whatever that urgent problem was two days earlier had just magically resolved itself. It wasn’t that big of a deal. At the time everybody’s panicking their arms and flying around, they’re flailing and people are freaking out like you’ve got to get those answered now now, now, now, now. Well, really looking at that same email three days later, really wasn’t that important either. It took care of itself. Somebody else took care of it. It just, yeah. And then if it’s still, if it’s still needed my response in three days, then okay it’s more important than I would respond to it then at that point. So, I still kind of do that if you, if you email is like one of the worst ways to reach me, but I think there’s something, there’s some kernel of truth in that, right? So stick that in your pipe and smoke it if you want to do anything with it. Anyway, I’ll let you guys go. Listen, go get my book. If you haven’t gotten my book before, you don’t know what I’m talking about. It’s my Wholesaling Lease Options book. Go to WLOBook com. WLOBook.com. I printed a bunch of them for free. You just got to pay shipping and handling. I’ll send it to you and it’s all about how I wholesaled lease options in 2009 since 2008 actually since 2008, I quit my job in 2009 using this strategy and I within three months of flipping lease options, my income, I was making more money doing that part time and it wasn’t my full time job and we’re starting to come back to that time with a downturn in the market and lease options are going to become more important in these next few years going forward than they’ve been in a long time. So you got to brush up on your lease option skills. You got to have it as a tool in your tool belt if you want to have success in the coming market. I’m telling you it’s important. So go get my book WLOBook.com. I think shipping is seven or eight bucks and you’ll get a lot out of it. I’m getting really good reviews. It’s not on Amazon, so don’t go there. I intentionally didn’t put it on Amazon. Now you can only get it at WLOBook.com. Alright guys. We’ll see you later. I appreciate you all. Bye. Bye.